Volkswagen has revealed its replacement for CC at the 2017 Geneva Motor Show. Called Arteon, the all-new model sits above the Passat in the range and will go on sale in summer 2017, with prices starting at around £30,000. It’s said to be more upmarket than the outgoing CC, with plenty of space for rear seat passengers and a sizeable 563 litre boot. That said, the interior layout shares a lot with the Volkswagen Passat, including metal elements that stretch right across the dashboard. There’s a 9.2-inch infotainment screen with navigation and gesture control, along with a head up display. Expect the latest connectivity technology including Android Auto and Apple CarPlay, along with plenty of safety gizmos like adaptive cruise control and traffic sign recognition. The petrol engine range features a 1.5-litre with 150PS, sold with either a six-speed manual or seven speed DSG, plus and a 2.0-litre with 190PS or 280PS, both fitted with a DSG as standard. The top 280PS engine also comes with 4Motion all-wheel drive as standard. The diesel engine is a 2.0-litre, available with 150PS, 190PS or 240PS. There’s a bit more choice when it comes to transmissions if you want the diesel too – though the top engine is DSG and 4Motion only. There will be three equipment levels – a base model, plus Elegance and R-Line. 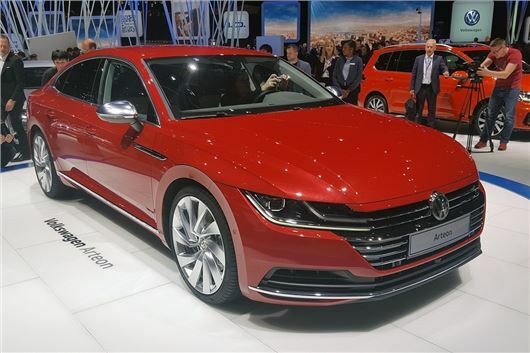 Differences between the three are largely cosmetic, though – with Volkswagen promising a high degree of customisation for buyers. But if you want high-tech gadgets it looks like you’ll have to spend some time ticking options boxes.